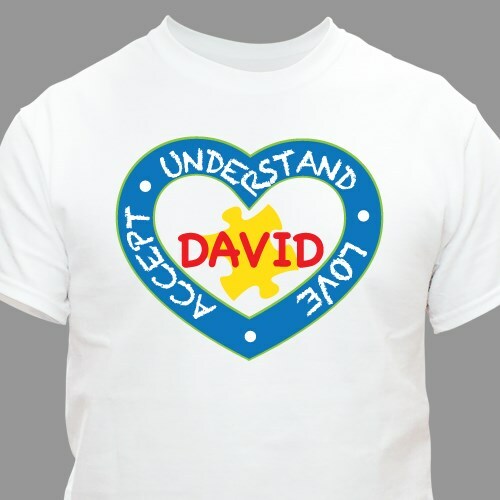 Understand, love, and accept those in your life who have autism when you wear this unique awareness t-shirt. Together, we can help others achieve these same three qualities and better understand the autism spectrum. This autism awareness design is featured on our premium, 100% cotton, machine washable t-shirt. Available in youth sizes XS-L and adult sizes S-3XL. Free personalization of any name is included. Additional Info Shop the autism awareness gifts and walk gear on MyWalkGear.com to find products for your next fundraising event or walk. Together, we can piece together the complex puzzle of the autism spectrum. A portion of your purchase will go to the organization or charity of your choice.